Financial, logistical and psychological barriers often get in the way of community college students transferring to four-year universities. Lately, universities are trying to change that. The path has been open for decades to students who want a bachelor’s degree: If a student doesn't have the tuition money or isn't ready to leave home, community college is a good place to start. But financial, logistical and psychological barriers often get in the way. More than three-quarters of first-time college students who enroll in community colleges don't transfer to a four-year school within six years. Lately, universities across the state have teamed up with community colleges to try to change that. Many have formed new partnerships designed to make the transition from one school to the other seamless. The deals reflect a growing commitment in the state and nationwide to promote two-year colleges as a cost-effective way to begin working toward a four-year degree. “Programs like these are an ideal way to steer around all the pitfalls,” said David Fonken, a dean at Austin Community College. Perhaps no Texas university has made a bigger effort in recent years than Texas A&M University. Officials there have made a priority of meeting the state’s workforce needs and have set a goal of having 25,000 engineering students by 2025, compared to 15,000 in 2015. School officials hope to find more diversity, given that 78 percent of its current engineering undergraduates are men and 70 percent are white or Asian. Community colleges are one of the key places they are looking. The colleges often attract poor and minority students that major universities have a hard time recruiting. That’s in part because the price is so low and students can enroll while still living at home. 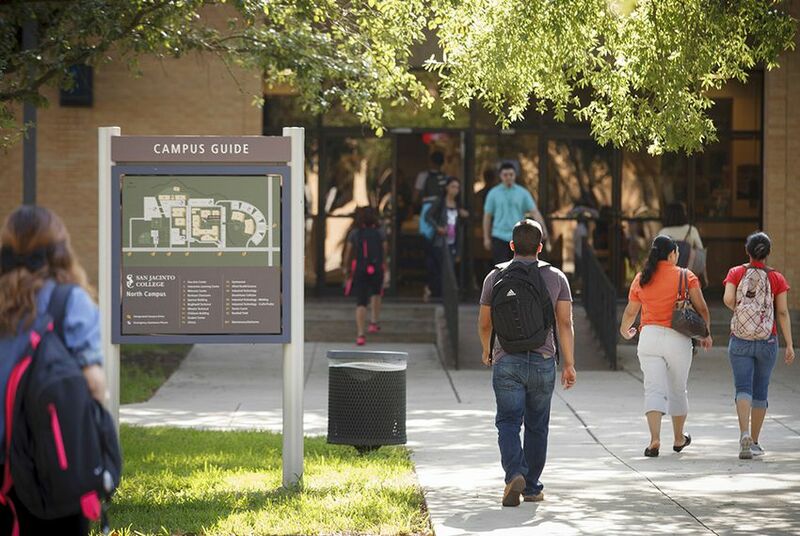 The average tuition and fees at a two-year public college in Texas is $2,446, compared to $8,347 at four-year universities, according to the Texas Higher Education Coordinating Board. Over the past 18 months, A&M has announced the opening of five engineering academies on community college campuses across the state. At those academies, students can apply to co-enroll at A&M. They take their non-engineering classes from the local school and take engineering classes taught by A&M professors who visit their campus. Then, if they keep their GPAs up, they can transfer to A&M’s College Station campus for the last two years of school. For students like Shams Al Bayati, the programs can be life-changing. After graduating from Memorial High School in Houston, she wanted a four-year degree in engineering but chose a community college to save money. Last year, she enrolled in the A&M engineering academy on campus and began taking classes from A&M professors. Her enrollment in the program also took her on field trips to the College Station campus for football games, career fairs and student orientations. By the time she was done at HCC, she felt ready to move on to A&M and study petroleum engineering. While many community college students feel hesitant about the academic rigor or unfamiliar culture of their new school, she said she had no problem adjusting. A&M academies have already opened at community college campuses in Dallas' El Centro College, Brenham's Blinn College and Houston Community College. Others are in the works in Austin and Brownsville. The university hopes to have 500 students enrolled by the start of next school year and may grow the program from there. “We thought of it as a program where we can reach out to excellent students across the state no matter what the circumstance,” said Katherine Banks, dean of engineering at A&M. At Tarrant County College, meanwhile, many students are now basically automatically admitted in nearby University of Texas at Arlington after two years. Any student who ever expresses an interest in UT Arlington is signed up for the two schools’ early transfer identification program, or E-TIP, which pre-admits students who meet certain GPA requirements. The two schools share data on students’ progress. And as soon as students enter the program, their tuition at UT Arlington is frozen, so they won’t be charged more if UT Arlington raises its prices before they officially enroll. The goal, UT Arlington President Vistasp Karbhari said, is to eliminate non-academic barriers to reaching a four-year college. “If there are obstacles, it should be studying hard. It should not be filling out a form,” he said. Similar programs are popping up across the state. Austin Community College also has co-enrollment deals with the University of Texas at Austin and Texas State University. And Lone Star College in Houston announced deals with Prairie View A&M University and Texas Southern University to provide fee waivers or discounts and scholarship opportunities for students looking to transfer from the community college. Meanwhile, state lawmakers are also working to ease the transition statewide. The higher education committees in the state House and Senate are studying the issue this year. And last year, the Legislature required all community colleges to adopt an interdisciplinary studies degree that was designed for students looking to transfer into universities. The efforts are young, and it will take time to figure out their full impact, officials say. But their creators say they are hopeful they will help the state achieve its goal of raising the number of young people who earn college degrees. Fonken, who oversees math and science education at ACC, said: "They give students security in an insecure world." Texas students were left scrambling after for-profit ITT Tech shut down nationwide. Texas State is experimenting with an online course system that could make students' freshman years free. Disclosure: Texas A&M University, the University of Texas at Austin, the Texas State University System, Houston Community College, the Austin Community College District, UT Arlington and Lone Star College have been financial supporters of The Texas Tribune. A complete list of Tribune donors and sponsors can be viewed here. Correction: An earlier version of this story incorrectly stated the status of the engineering academy at Blinn College in Brenham. It has already opened.